What Is the Role of the Placenta—Does It Protect against or Is It a Target for Insult? The placenta is not just a barrier but has many functions that are vital to the health of the embryo/fetus. The placenta is the anchor, the conduit, and the controller of pregnancy—and it can also be a target for toxicant action. The placenta encompasses not only the chorioallantoic placenta but all of its extraembryonic membranes (chorion/amnion) and the yolk sac. (Figure 1). The placenta and its membranes secure the embryo and fetus to the decidua (uterine lining) and release a variety of steroid and protein hormones that characterize the physiology of the pregnant female. Alterations in any of these functions can lead to pregnancy loss (miscarriage or stillbirth). Of particular concern is the relative hypoxic environment that is normally present during early embryonic development. Abnormally high maternal blood flow to the implantation site can produce higher levels of oxygen and lead to miscarriage and later in gestation can lead to pre-eclampsia/eclampsia, as noted in Figure 2. The placenta transports nutrients to the embryo/fetus and waste products away from the embryo/fetus but, during this exchange, foreign compounds can hitchhike across the placenta. The placenta stores chemicals and also serves as a site for biotransformation. Substances that may be benign to the pregnant woman can be transformed by metabolizing enzymes in the placenta to agents toxic to the embryo/fetus, e.g., 13-cis retinoic acid. Thus, the functions of the placenta that nourish and support the fetus can be compromised and result in placental toxicity, fetal nutrient deprivation, and production of toxic chemicals. It has been noted that placental size can be used as a proxy for fetoplacental metabolism, while histopathological assessments of placental inflammation have been associated with autism. Figure 2. 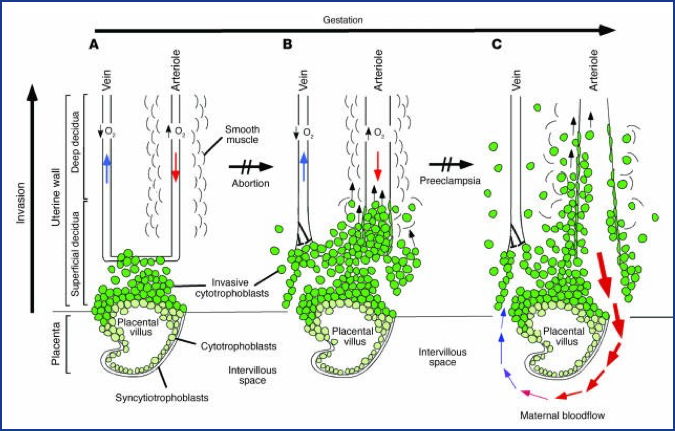 Oxygen tension plays an important role in guiding the differentiation process that leads to cytotrophoblast invasion of the human uterus. (A) The early stages of placental development take place in a relatively hypoxic environment that favors cytotrophoblast proliferation rather than differentiation along the invasive pathway. Accordingly, this cell population (light green cells) rapidly increases in number as compared with the embryonic lineages. (B) As development continues, cytotrophoblast cells (dark green cells) invade the uterine wall and plug the maternal vessels, a process that helps maintain a state of physiological hypoxia. As indicated by the blunt arrows, cytotrophoblast cells migrate farther up arteries than veins. Patterns of placental development are similar among different animal species, while developmental time schedules may differ. The placentae themselves vary widely among species. Marsupials, for example, have only a yolk sac, while sheep have multicotyledonary (multi-lobed) placentation. Rats, mice, and rabbits, the principal species used for teratology testing, all have yolk sac placentae, as do humans, but the functions of the yolk sacs are very different. In rodents and rabbits, the yolk sac everts (turns inside out) and becomes an important port of entry for molecules (e.g., immunoglobulins) into the embryo and fetus throughout pregnancy, even though a chorioallantoic placenta develops during the last half of pregnancy to provide gas and small molecule exchange. In contrast, the yolk sac shrinks and becomes vestigial in humans during the latter part of the first trimester. In laboratory species, immunoglobulins, critical for immune function in the neonate (IgG), are transported only through the visceral yolk sac; in humans, transport occurs via receptors in the chorioallantoic placenta. Both the yolk sac of the rodent as well as the chorioallantoic placenta of the human are important sites for degrading proteins and providing amino acids to the embryo and fetus. Trypan blue and other agents that interfere with protein degradation can kill the rodent embryo/fetus or can cause birth defects. 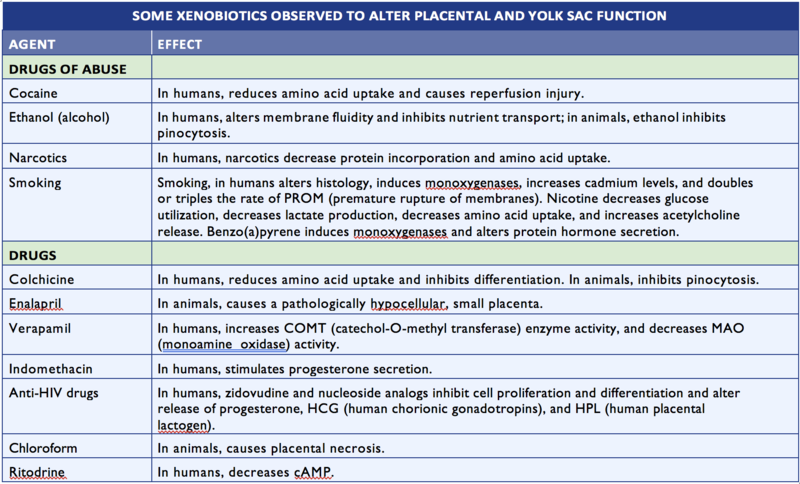 Many agents, including the heavy metal s, such as cadmium, can alter placental function (see Table 1). Injecting cadmium into a pregnant rat close to birth causes the fetus to die and the placenta to degenerate within 24 hours. Directly injecting fetuses with cadmium near term doesn’t kill them, although they do develop hydrocephalus (head enlargement due to excess cerebrospinal fluid in the ventricles of the brain). Cadmium was previously thought to affect primarily the kidney, but it turns out that, at least in rats, cadmium is even more highly concentrated in the placenta. Human placentae definitely concentrate cadmium and can degenerate because of cadmium exposure. Early in pregnancy, the effects of cadmium on the placenta can lead to miscarriage; women affected by exposures to high concentrations of cadmium can have repeated pregnancy losses. The ability of the placenta to sequester cadmium protects the fetus or embryo for a while, but when a pregnant woman is exposed to substantial amounts of cadmium, the placenta—and with it, the fetus—may die. One source of cadmium is cigarette smoke, which may be one reason why smoking can compromise the growth of the conceptus. Smoking is associated with pregnancy loss, premature delivery, and decreased birth weight. Smokers’ placentae have very high levels of cadmium compared with those of nonsmokers, and these levels may contribute to the adverse outcomes that are associated with cigarette smoke. The placenta can prevent or at least delay the transmission of viruses that infect the mother. Experiments have shown that a variety of viruses, including cytomegalovirus (CMV), human immunodeficiency virus (HIV), Coxsackie B, and Echo 11 cannot directly cross the placenta. However, these viruses may infect certain cells within the placenta. Whether or not the placenta is infected determines whether the embryo/fetus eventually becomes infected. In vitro models using dual perfusion of the human placenta, explant cultures, chips, and cell cultures have been useful to assess transfer of agents as well as effects on the placenta. Studies using human placental perfusions have been used in lieu of rodent studies for human proteins when FDA approval for these types of new agents has been necessary. Clinical evaluations of both embryo/fetus and placenta are being pursued with ultrasound and magnetic resonance imaging and elastography in anticipation of identifying biomarkers of the at-risk placenta and fetus. Following delivery, the baby gets all of the attention. The placenta is neglected, often assigned to the trash; however, detailed pathologic/morphologic and ’omic assessments of the placenta can not only be critical for determining what happened in utero but also may be helpful in predicting what may be health issues for the child and the adult. During pregnancy, the placenta is the star of the show. Teratology would be incomplete as a science without attention to this important organ. Burton GJ, Jaunaux E, Charnock-Jones DS. The Influence of the Intrauterine Environment on Human Placental Development. Int. J. Dev. Biol. 2010; 54:303–312. Desforges M, Sibley CP. Placental Nutrient Supply and Fetal Growth. Int. J. Dev. Biol. 2010; 54:377–390. Eisenman CJ and Miller RK. Placental Transport, Metabolism and Toxicology of Metals, In Toxicology of Metals. Chang LW (ed.) Boca Raton: CRC Press, pp. 1003–10027, 1996. Hu D, Cross JC. Development and Function of Trophoblast Giant Cells in the Rodent Placenta. Int. J. Dev. Biol. 2010:54:341–354. Miller RK, Ebbesen P, Popek E, Nahmias A, Polliotti B, Shiekh A, Zachar V, Roberts D and Unadkat J, The role of the placenta in the vertical transmission of HIV and other infectious agents, Trophoblast Research 1998:12:225–232. Miller RK, Genbacev O, Aplin J, Turner M, Caniggia I, Huppertz B, Human Placental Explants in Culture: Approaches and Assessments, Placenta 2005:26:439–48. Misra DP, Salafia CM, Charles AK, Miller RK. Placental measurements associated with intelligence quotient at age 7 years. J Dev Orig Health Dis. 2012:3:190-7. Ornoy A, Chen L, Silver RM and Miller RK. Maternal Autoimmune Diseases and Immunologically—Induced Embryonic and Feto- Placental Damage. Birth Defects Research A 2004:70:371–381. Red-Horse K, Zhou Y, Genbacev O, Prakobphol A, Foulk R, McMaster M, Fisher S. Trophoblast Differentiation during Embryo Implantation and Formation of the Maternal-Fetal Interface. J Clinical Investigation 2004:114:744–754. Roberts, VHJ, Lo, JO, Salati, JA, Lewandowski, KS, Lindner, JR, Morgan, TK, Frias, AE. Quantitative assessment of placental perfusion by contrast-enhanced ultrasound in macaques and human subjects Amer. J. Ob/Gyn 2016:369: e1-e7. Salafia CM, Misra DP, Yampolsky M, Charles AK and Miller RK. Allometric Metabolic Scaling and Fetal and Placental Weight. Placenta 2009:30:355–360. Salafia, CM, Thomas, DM, Roberts, DJ, Straughen, JK, Catalano, P, Perez-Avilan, G. First Trimester Detection of Placental Disease: Challenges and Opportunities Amer J Perinatol.2016:33:1306-1312. Schneider H, Miller RK. Receptor-mediated Uptake and Transport in the Human Placenta. Int. J. Devel Biol. 2010:54: 367–375. Slikker W and Miller RK. Placental Metabolism and Transfer—Role in Developmental Toxicology, In: Developmental Toxicology, 2nd edition, Kimmel C, and Buelke-Sam J (eds. ), New York: Raven Press, pp. 245–283, 1994. Wier PJ, Miller RK, Maulik D, di Sant’Agnese PA, Cadmium Toxicity in the Perfused Human Placenta, Toxicol. Appl. Pharm. 1990:105:156–171.